Ahead of the release of her 2017 album, I Believe In You, we had the chance to ask country music legend Dolly Parton one question and one question only. But what do you ask one of the most honored country performers of all time, whose ultra-successful career has spanned five entire decades? Well, if you're us, you ask her something about guitars. Reverb: Can you tell us about your very first guitar and the instrument that you dreamed of owning when you were growing up? He had this little Martin guitar that I loved, so when he saw how serious I was about my music, he gave me his little Martin guitar. It was my treasure." "Music was such a large part of our whole family. All of my mama’s people were musical. They all played some sort of musical instrument. Of course, I took my music real serious, and I was always plucking along on somebody’s instrument — whatever they would leave lying around or whenever my family would come. But I always loved the guitar. "I had two uncles who played — Uncle Bill, who helped me get into the business, and Uncle Lewis, who was also a great guitar player. He had this little Martin guitar that I loved, so when he saw how serious I was about my music, he gave me his little Martin guitar. It was my treasure." "When I left home at 18, I put it in the loft because it was beat up. My plan was always to — when I got money, when I got rich and famous — have it fixed up. But the loft burned out of our house, and burned up my guitar, so I only have the neck of that one. But I have collected little Martin guitars all through the years. I have some classic little guitars, especially the Martins, the baby Martins." It's not entirely clear what exactly Dolly is referring to when she says "baby Martin" like the one that was lost in the fire, but our guess is that it was a Martin 5-18 model, which was the smallest guitar that Martin made in that period and a model that Dolly has been known to play. The guitar Dolly's holding in the picture to the right, for instance, appears to be one example. Of course, throughout her long career, Dolly has played a lot of guitars going back to her 1967 debut album, Hello, I’m Dolly. 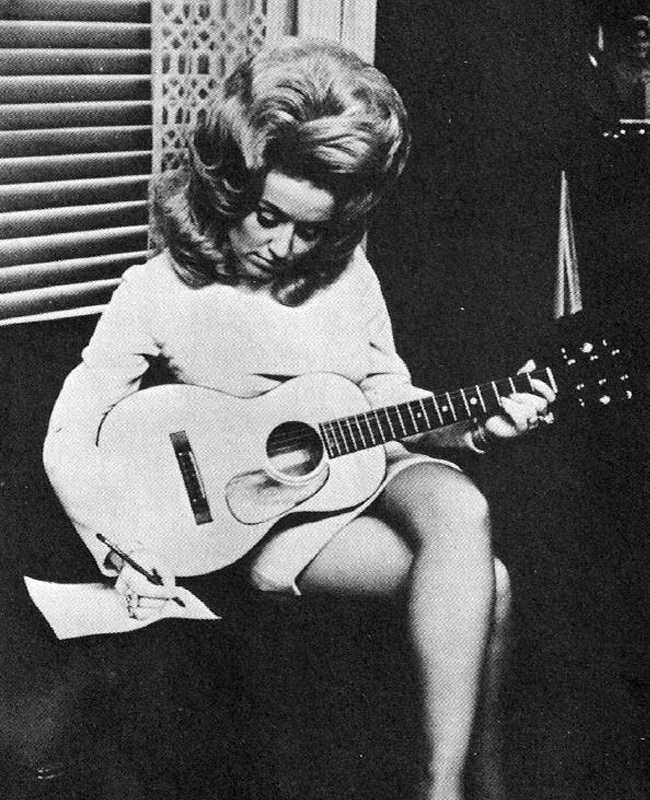 She's been seen with many nylon-string guitars and other instruments over the years, during which she has released hit singles like “Jolene” and “9 to 5,” won nine Grammys (out of a staggering 47 nominations), ten Country Music Association Awards, seven Academy of Country Music Awards, and three American Music Awards. And that's on top of her amazing philanthropic work and business operations, like the the Dollywood theme park and sister Splash Country waterpark in Tennessee. Thanks to Dolly for taking the time to share that story with us. For more on the new album, you can head to her website here.